For the third year, the Florida Microplastic Awareness Project promoted the month of September as Microplastic Awareness Month. Around the state, there were various educational activities designed to help teach people about the problems with plastics and to encourage people to look for alternatives to single-use plastics, to recycle plastic items properly, and to reduce plastic waste. The Florida Microplastic Awareness Project was created in 2015 by Dr. Maia McGuire. The project was initially funded by an outreach and education grant from NOAA’s Marine Debris Program. In the past three years, almost 2,000 people have taken a pledge to reduce the amount of plastic waste that they generate. Maia held three webinars during September 2018. Each ran for approximately 30 minutes. The webinars were recorded and were posted on the Florida Microplastic Awareness Project’s website. On Thursday September 6, the topic was “Plastic in the ocean: What we do and do not know.” Maia provided answers to some commonly-asked questions about plastic pollution in the ocean. On Thursday September 13, the topic was, “Thinking Beyond ‘Skip the Straw.’” 2014-15 saw the “ban the microbead” movement in the US. In 2018, a huge wave of municipalities and companies have started banning/eliminating single use plastic straws except by request. These movements have had great momentum, but are these steps by themselves enough? What can/should be done beyond banning straws, bags or foam containers? Stew Harris from the American Chemistry Council joined Maia for this webinar. The final webinar in the series aired on September 20, and was titled, “Bioplastics–better than petroleum-based plastic?” We have all probably seen plastic cups, utensils or other products that are made from plants. 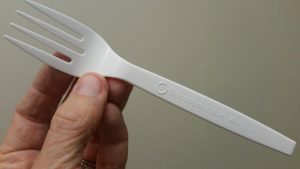 While they are labeled as compostable, are they really better than petroleum-based plastic in the environment? Maia discussed plant-based PLA plastics as well as the bacterial waste-based PHA plastics.